Three rods are screwed on separately to the ceiling. Second ends of rods are connected together in one point. In connection point works a force P. Force P is directed down. All rods under work of force P are stretched. In exercise we will designate equilibrium equations. Hooke’s law will also be used. 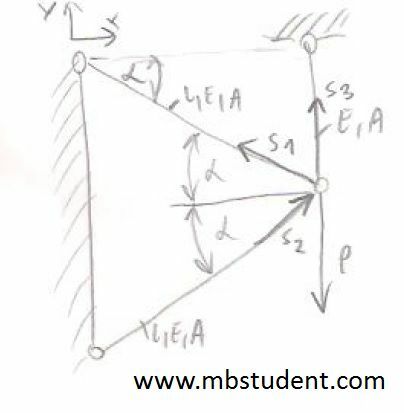 Subject of example is to find minimum value of rod’s section area which will provide enough strength. Two rods are screwed on separately to the wall. Third rod is fixed to the ceiling. Second ends of rods are connected together in one point. Force P works in point of connection. Force P is directed down. Two rods under work of force P are stretched. One rod is squeezed In exercise we will designate equilibrium equations. Hooke’s law will also be used. 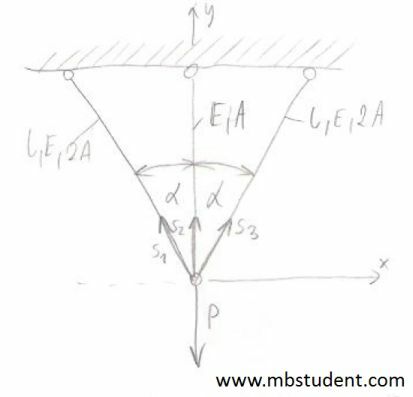 Subject of example is to find minimum value of rod’s section area which will provide enough strength.